Available for 6-12 week block bookings during winter 2018. April 20 to Dec 20th. A casual, spacious, comfortable 1910 character Villa. 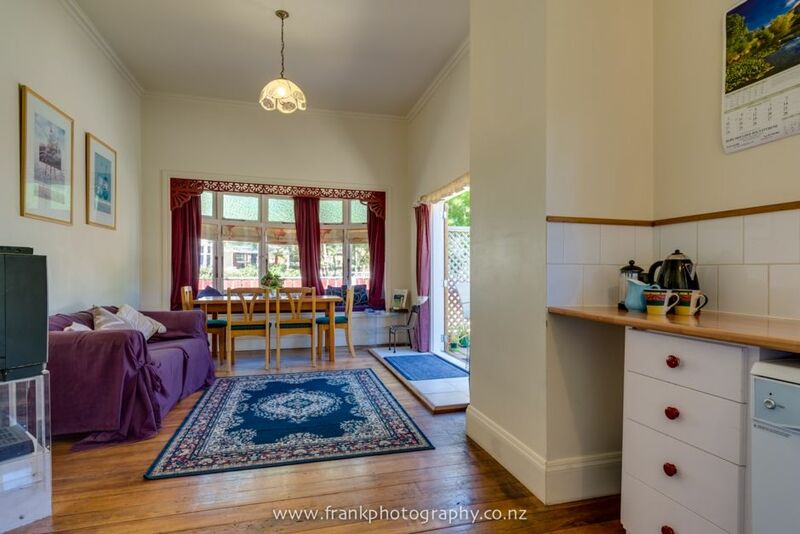 Family accommodation - child and pet friendly. Fully furnished incl linen. Fully fenced . Greengrocer, post, mini-market, chemist and salon. 7 min walk from Countdown and The Warehouse. and Richmond. Backpacker style house but you get exclusive use. $100 cleaning fee applies to all bookings. $750 p.w for short term low season rental over 1 month. Wifi included. Although retained as a feature of this old character Villa - open Fires are not permitted in this part of town. Alternative heating supplied. some toys, books and DVDs on site. grounds after own animals please. Available for 6-12 week block bookings during winter 2018. April 20 to Dec 20th. Lots of old world charm in this century old home. Great central location - between beach and city centre. Very easy to get around. Fish and chip shops really close. Very clean & tidy. Nice deck area. Was a hot day when we arrived & windows & fan had kindly been left open & on. A good place to stay, easy walk to the town centre. Great location within walking distance of town centre. Property would benefit from a bit more TLC, and is apparently currently being prep'd for repaint. Well located near the Nelson town hub. The cottage is very room and has aesthetic appeal. The outdoor area is also very good with good flow on from the lounge. The three main bedrooms are spacious. However, for four nights the mattresses were a stretch. I would have also liked the toilets cleaner. Just a note to the owner - for a couple of days my wife was bitten by some bugs in the second bedroom (the one on the right as you walk towards the corridor from the lounge). May worth checking the mattress. Overall, if the property gets some more attention from the owner it can be a very good place to stay. Lovely old villa was very homely . Great central location. Easy to get around. Excellent accom. Cheers.